aluminum, piston pins and oil rail support when required. Piston ring kits listed are either Std or File Fit Piston Rings. twist 2nd ring standard tension oil ring and oil rail support when required. Federal-Mogul Race rod & main bearings. 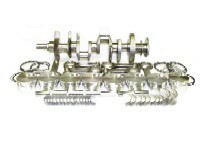 Small Block kits include a Crankshaft forged of 4340 steel with nitrided rod and main journals. Big Block kits include a crankshaft forged of 4130 steel with induction hardened journals. ESP Rotating Assemblies consist of name brand quality components in stock for immediate shipment.